Recognise these planet names: Vulcan, Neptune, Pluto, Nemesis, Tyche and Planet X? They all have one thing in common: their existence was predicted to account for unexplained phenomena in our solar system. While the predictions of Neptune and Pluto proved correct, Nemesis and Tyche probably don’t exist. Now we have another contender, Planet Nine – the existence of which astronomers predicted last month – but we may need to wait ten or more years for it to be confirmed. Compare this to Vulcan. While many claimed to have observed the predicted planet, it took 75 years and Einstein’s general theory of relativity to consign it to the dustbin of history. Astronomers are finding new exoplanets in other parts of the galaxy all the time. So why is it so hard to pin down exactly what is orbiting our own sun? One reason is that very different methods are used to identify planets in other solar systems. Most involve observing periodic changes in the star’s light as the planet swings around it, as intercepted by telescopes such as Kepler. Inside our own solar system, we can’t see these effects when we’re looking out into the darkness rather than towards the sun. Instead, planet-hunters use indirect means. Slight wobbles and perturbations in the orbits of planets, comets and other objects may reveal the gravitational presence of ghostly neighbours we didn’t know we had. This method has been used often over the past two centuries to predict new planets. In 1843, French mathematician Urbain Le Verrier published his provisional theory on the planet Mercury’s orbital motion. Three years in the writing, it would be tested during a transit of Mercury across the face of the sun in 1845. But predictions from Le Verrier’s theory failed to match the observations. Mercury was late by 16 seconds! Le Verrier was not deterred. 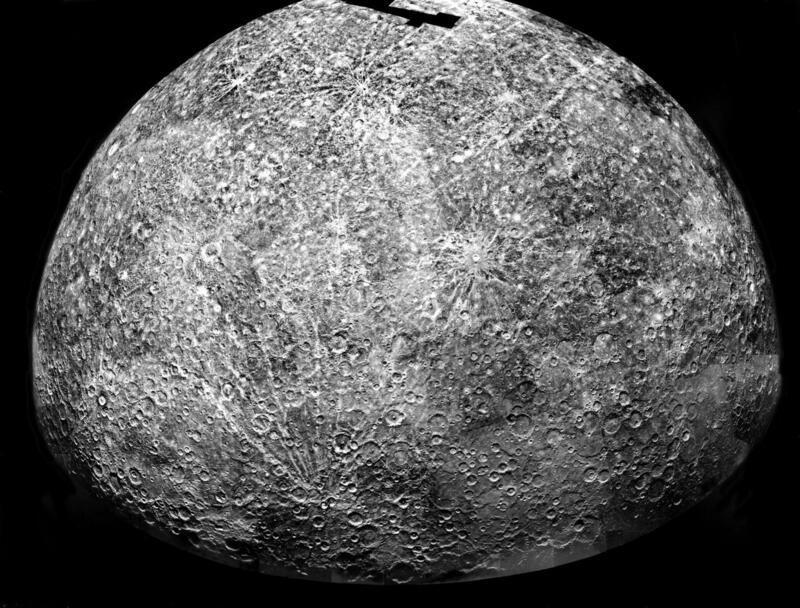 Further study showed that Mercury’s perihelion – the point when it’s closest to the sun – advances by a small amount each orbit, technically called perihelion precession. But the amount predicted by classical mechanics differed from the observed value by a miniscule 43 arcseconds per century. Initially, Le Verrier proposed that the excess precession could be explained by the presence of an asteroid belt inside the orbit of Mercury. Further calculations led him to prefer a small planet, which he named Vulcan after the Roman god of fire. It was a credible claim, as in 1845 Le Verrier had also successfully predicted the position of Neptune from perturbations of Uranus’s orbit. Now astronomers just had to find Vulcan. As planet fever hit the popular press, professional and amateur astronomers reviewed solar photographs to see whether Vulcan transits had been mistaken as mere sunspots. The first possible sighting came immediately. In 1859 Edmond Lescarbault, a country doctor and gentleman astronomer in France, claimed to have seen Vulcan transit across the sun. 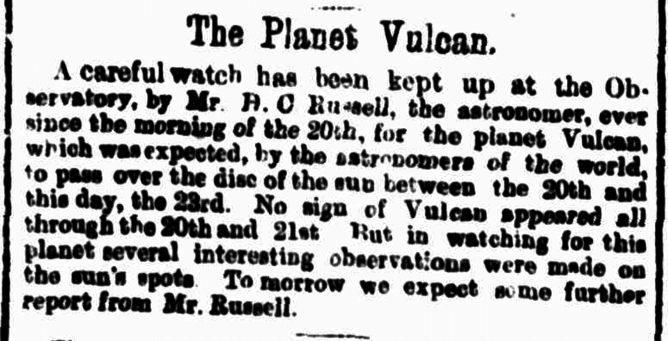 Further sightings continued, and by the mid-1860s The Astronomical Register listed Vulcan as the innermost planet. Vulcan’s moment in the sun came to a head in 1869. Observations of solar transits in March and April and a solar eclipse in August failed to see the elusive planet. No sign of Vulcan appeared all through the 20th and 21st. But in watching for this planet several interesting observations were made of the sun’s spots. The explanation for the missing seconds came from a completely different direction. After Einstein published his general theory of relativity in 1915, it was revealed that the discrepancy was caused by the sun’s distortion of spacetime. In 1905, the American astronomer Percival Lowell started hunting for a Planet X. He predicted it would lie beyond Neptune, just as Neptune lies beyond Uranus. His calculations led astronomers at Lowell’s namesake observatory to find Pluto in 1930. Speculation about unsighted planets never entirely died down in the astronomical community, but decades passed without any major breakthroughs. In the 1950s, though, the solar system potentially expanded to a distance 100,000 times further that Earth’s orbit. The Dutch astronomer Jan Hendrik Oort hypothesised the existence of a spherical distribution of icy bodies. The Oort Cloud is thought to be the source of long period comets, which have eccentric orbits and periods from 200 to many thousands of years. In 1951 the Dutch-American astronomer Gerard Kuiper proposed that a similar belt of icy objects beyond Neptune’s orbit could account for short-period and short-lived comets. In 1992 astronomers David Jewitt and Jane Luu discovered the first of these Kuiper Belt Objects (KBO) – originally called “Smiley”, it is now catalogued more prosaically as 1992 QB1. The most well-known KBOs are Eris, Sedna and the dwarf planet Pluto. After flying by Pluto on July 15, 2015, the New Horizons spacecraft is due to encounter KBO-2014 MU69 on January 1, 2019. Other predictions for new solar system objects came from looking at the terrestrial fossil record, rather than the skies. On the basis of statistical analysis of mass extinctions, the America palaeontologists David Raup and Jack Sepkoski proposed in 1984 that they coincided with large-impact events. Independently, two teams of astronomers suggested that a dwarf star, later named Nemesis, passes through the solar system every 26 million years, flinging comets on a path to impact Earth. Comets provide key evidence in these studies. Analysis of perturbations in comet orbits led astronomers to propose that a brown dwarf (bigger than a planet but smaller than a star) exists in the outer solar system. It is named Tyche, the good sister of Nemesis. A search of the Wide-Field Infrared Survey Explorer (WISE) satellite data in 2014 ruled out the existence of both Nemesis and Tyche. In 2003, the “Pluto killer” Michael Brown was part of a team that discovered what he called “the coldest most distant place known in the solar system”, which came to be known as Sedna. The discovery of this Kuiper belt object prompted further searches and much speculation as to its origin – particularly its strange orbit. As more and more objects were identified in the Kuiper Belt, it was possible to observe orbital anomalies more precisely. The simplest way to explain them was another planet. The 2016 orbital calculations by Konstantin Batygin and Mike Brown strengthen the concept of an unseen planet, which they call Planet Nine. What difference does it make if there is another planet lurking out there? We’re not likely to see it any time soon. At its closest approach to Earth, the predicted Planet Nine will still be 200 astronomical units (au) away (about 30 billion kilometres). Compare this to Pluto’s orbit, which is an average of 39 au from the sun (5.8 billion kilometres). 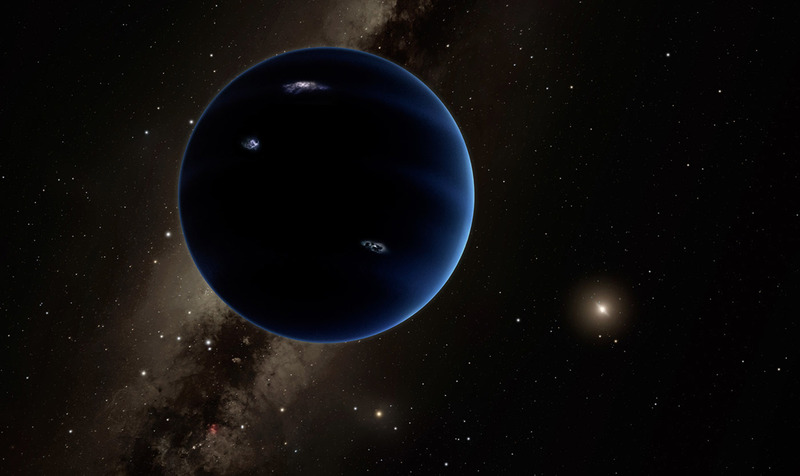 We don’t even know where Planet Nine is right now, if it exists at all. But everything we learn about the dark outer regions contributes to the story of how our solar system evolved, and, more importantly, how it will change in the future. What with Russia’s Sputniks, and the gaudy possibilities of interplanetary travel to come, our solar system seems to be shrinking somewhat like the Earth did when aeroplanes came into use. Now, it seems, the opposite is true: the mysterious trans-Neptunian region of the solar system has still much to surprise us. 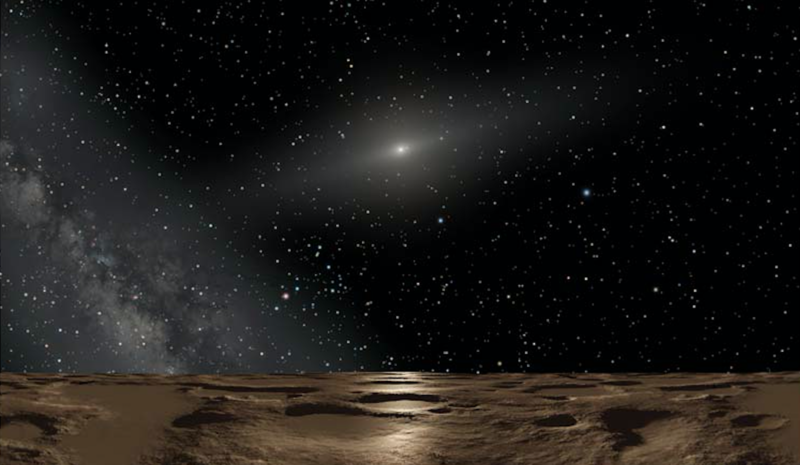 Featured image: Artist’s impression: Looking back 12.9-billion km towards the sun and the inner solar system from Sedna, one of the recently discovered minor planets in the Kuiper belt. NASA, ESA and Adolf Schaller.